As digital advertising and marketing continues to evolve toward branded content and millennial female consumers become more trusting of this type content, it's not surprising that women have a point of view about the specific types of content they give permission for auto marketers to sponsor. As part of our 2017 POPSUGAR Insights Auto Report, we surveyed over 1,200 US millennial female in-market auto shoppers to better understand their perspective on shopping for their next vehicle, especially as it pertains to branded content. 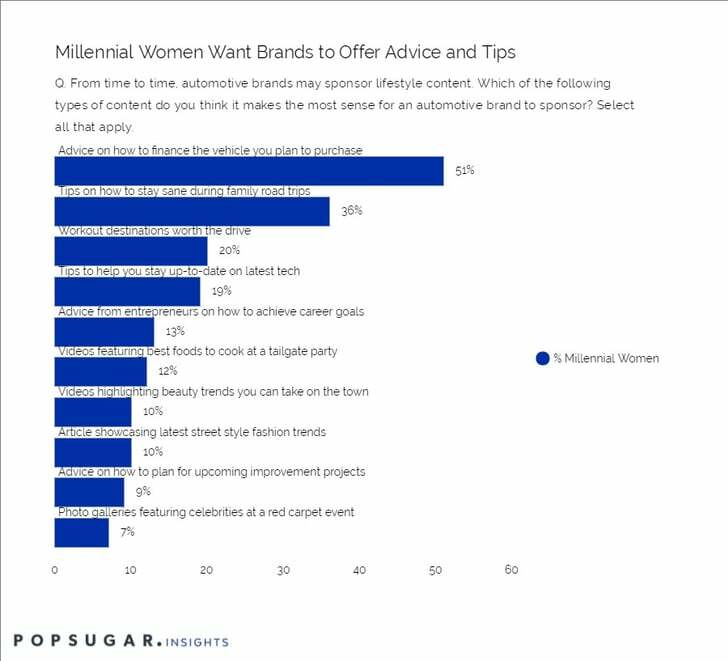 Overall, millennial women want auto brands to sponsor content that offers valuable advice and helpful tips as they navigate their decision journey from awareness to consideration to purchase, but their opinions are not limited to just endemic content about the purchase process, but expand to include lifestyle topics such as travel, fitness, career advice, and food. This includes content offering "advice on how to finance the vehicle they plan to purchase" (51%), tips on how to stay sane during family road trips (36%), and workout destinations that are "worth the drive" (20%). The eclectic mix of preferred content means that auto brands have the permission from millennial women to get creative and offer a host of valuable lifestyle content, provided that it delivers valuable advice and helpful life tips.